Technically Doomtree is a crew and a label, yes, but it takes about three seconds at a Doomtree show to realize that to their fans it is more than just a LLC or members of a group. Judging by the amount of fans wearing both official and homemade merchandise, and the quantity of Doomtree tattoos visibly present, the group are more akin to a community or lifestyle brand to fans in Minneapolis at this point. The group/label/cult were the central focus of the latest Red Bull Sound Select showcase here in Minneapolis. 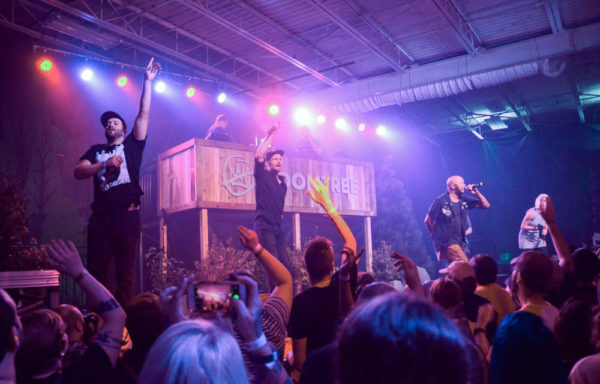 The name of the event was “Doomtree Forest,” held at a local skate park, and it was a label showcase in the vein of their now defunct Doomtree Blowout, just with a lot more corporate sponsorship (and less drink options). It was 3+ straight hours of music, starting with short sets from lesser known artists like Cloquet and Longshot, but quickly transitioned into solo sets by the Doomtree crew. In quick order the crowd saw micro sets from Mike Mictlan, Cecil Otter, Sims (with guests), POS (as Four Fists w/ Astronautalis) and Dessa. Before a full crew Doomtree set, there were really quick sets from Shredders and new project Night Stone. The sold out crowd, some of whom were up on a skate ramp adjacent to the stage, ate up the entire show. It was the kind of concert where me, as a casual fan, felt out of place not knowing every word to every song. After a decade of Doomtree blowouts, it made sense to wrap up the showcase that the group had altered in every way they could think of, but the Doomtree Forest showed that the spirit of the event, and fan interest, still can create a cool event.